Faras Bean (Hindi), Sem (Hindi), Tingal Avre Kai (Kannadi), Farabsi (Marathi), Tingal Avro (Konkani). It belongs to the Leguminosae family, it is thought to be originated in America via various theories. It is found the French bean remains were found in the excavation of ancient Mexican and Guatemalan cities which dated almost 7000 years ago. It is considered that french beans were cultivated almost 7000 years ago by Indian tribes settled in Mexico and Peru. With all the sought out speculation, it is found to to be of South American Origin in Peru and Columbia. In Europe, it was bought in notice by the Spanish and was one of the dominant vegetable in 1569 in homes of Italy. It was spread to Asian countries like India, China and also Africa by Europeans. It is basically an unripe fruit and protective pods of various common bean cultivars, which is harvested before the seeds inside are mature and consumed as part of our food. It is considered to be a very rich source of protein and vitamins, hence recommended in our diet for healthy living. It also provides our body carotenoids like beta – carotene, neoxanthin, lutein and violaxanthin. It also contains antioxidant capacity and hence helps our body to rid away of harmful radicals and also benefits our cardio vascular system. They are rich source of dietary fiber which protects the mucosa in the colon by reducing exposure to toxins. It is rich source of Zea-Xanthin, a dietary carotenoid which gives protective UV filtering function. It has humungous health benefits and should be an important supplement of our diet. It is one of the most cultivated crop in India due to its high protein and various other benefits. In 2004, at global level the total production of dry bean was about 19,393 million metric tons in an area of 26.6 million hectares. India is also responsible for large production of french beans, accounting for 37.52% of total production. The productivity although is low in India due to unfavourable conditions and many countries like Lebanon, Africa, Iran, Indonesia, China, Japan etc. are ahead of India. It is majorly grown in the temperate and tropical regions of India and shows higher productivity around temperature of 21°C and an optimum temperature of around 16 to 24°C is better for its greater yield. It is not advisable to grow french bean at very low or high temperature as t might cause poor productivity with dropping of buds and flowers. It requires an annual rainfall of 50 – 150 cm for good harvest. It is highly susceptible to frost and should be harvested before onset of frost. Too much rainfall may cause water logging which causes flower drop and makes the plant to various diseases. It is cultivated in India between February to March in hills and in October to November in Plains. It is flexible in terms of soil and can be grown in a wide range of soil ranging from light sand to heavy clay soil. Although it can be grown in wide range of soils, it gives best results in well drained loams. It requires an optimum pH of 5.2 to 5.8 for better growth and is also sensitive to high salinity. Seed germination requires that the soil is adequately moistened. Germination requires a soil temperature of nearly 15°C and at 18°C germination takes almost 12 days and at 25°C germination takes about 7 days. It was developed by IIHR Bangalore, which produces pods which are straight, flat and green with large brown seeds. It gives a yield of 19t/ha of pods and 3t/ha of seeds. It was developed by IIHR Bangalore. It produces pods which are oval, light green and fleshy. It gives an yield of 19t/ha in 70 days. It is developed by IARI, Katrain. The plants are of bushy cultivar with pink flowers. The pods are green, round and long. It is resistant to Mosaic and Powdery Mildew. It is developed by IARI and it is a pole variety cultivar. It produces pods which are medium in size, round, fleshy and gives an yield of 26t/ha. It is developed by VPKAS, Almora. It is a dwarf cultivar and produces pods which are round, light green and fleshy. It gives an yield of 10 – 11t/ha. It is developed by Tamil Nadu Agricultural University. It is a pole type variety which is suitable for growing in hills and gives pods which are long and flat. It gives an yield of 5 -6 t/ha in 90 to 100 days. It is developed by Tamil Nadu Agricultural University. It is a bushy type cultivar which produces pods which are slightly flat and seeds with dark purple colour. It is tolerant to diseases like root rot and anthracnose. It is developed by Tamil Nadu Agricultural University. It is a pole type variety with pods which are long with low fibre. Both these varieties are developed by NDAU&T, Faridabad which is a mid season variety and gives 10t/ha yield. It is developed by MPKV, Rahuri which produces pods which are long, flat and light green in colour. It is tolerant to Anthracnose, yellow Mosaic and Wilt disease. In hills, the soil is dug properly and mixed with Farm yard manure (FYM) after which beds are formed of appropriate size. In case of plains, the soil needs to be ploughed twice following which ridges and furrows are made. It is very important to plough the fields 2 or 3 times properly to fine tilth. During the last ploughing planking is done to make the soil bed friable for sowing. French beans seeds which are matured and dried are used for propagation. It is important to care for the seeds for efficient germination and good production. French bean seeds can be sown twice in the year in two different seasons. The sowing time also varies depending on the type of region. In plains, it can be sown in January – February and also can be sown in July – September; in hills it can be sown between March to June. It is preferable to sow them in warm soil. It is advisable to not grow the french bean in the same soil as was grown previous year for better productivity. A groove or drill can be made in the soil, which should be almost 5 cm deep and almost 10 cm away from each other. There are different types of french beans which require different cultivation methods. In case of the climbing french beans, they can be grown by staking on any support. Traditionally, they are grown in double rows of bamboo canes with a space of 45cm between the rows. The bamboo canes are placed 15cm apart from each other and tied at top to a horizontal cane. After the bamboo structure, plant one bean plant at base of each cane and tie their shoots loosely to it enabling it to grow upwards efficiently. Another variety of french bean is dwarf french beans, which grow only 45 cm tall and thus can be grown in small blocks. In case of the bush type of french bean, the pods are allowed to mature for 110 days and the seeds are sown. The seeds are sown in fields in ridges and furrows. It depends on the type and variety of the French bean. If it is dwarf bean, about 50 to 75kg/ha is required and in case of pole type 25kg/ha is required. The plants are susceptible to many diseases and thus seed treatments aids in getting good productivity. Below are various ways to treat the seeds. The seeds can be treated with 4g/kg of Trichoderma or 2g/kg of Thiaram or Carbandazim before 24 hours of sowing the seeds. The seeds can be treated with Rhizobium culture at 30 gm sugar solution per kg of seed and it can also be treated with Rhizobium phaseoli for quick nodulation. Bush type of french bean should have an optimum spacing of 5 – 10cm between them with 0.6 to 0.9m space between the rows. In case of pole french beans, the seeds can be sown 15 – 25cm apart with a space of 0.9 to 1.2m space between rows. Dwarf type french beans can be planted 40 to 70 mm apart with spacing between rows to be 450 to 600mm. Intercropping is one of the most important way to increase the productivity of the crop. It can be intercropped with several crops like maize, soybean, popcorn, groundnut and rice which helps in giving a better yield. The rotation also depends on the area. In uplands, it can be grown in the month of August or September after maize production. In some areas, intercropping of pole beans with corn or okra as stalk gives higher yield and also okra stalk makes itself a brilliant support for the vine to climb. French bean is a shallow rooted crop, thus it becomes a sensitive crop to both water stress and water logging. It is necessary that only required amount of water reaches the crop. If some amount of moisture remains after rainy season, it is very good for the plant growth. If the plant is subjected to water stress conditions when the flowers are in pre blooming stage and pod filling stage, it adversely affects the plant productivity. If the french bean cultivation is done on black cotton soil, there are chances of water logging and hence it is advisable to grow the french bean on ridges. The plant can be irrigated through furrow irrigation method rather than the regular irrigation. Irrigation totally depends on the type of cultivar, soil as well as the climate conditions. If there is water deficit during vegetative period, it retards plant growth and leads to non uniform growth. It is required that the plants are properly irrigated during flowering period which ultimately leads to good yield, but also if there is water logging it might increase disease incidence. The french bean crop can be supplemented with partial or full irrigation, depending on the variety. French bean is a leguminous crop and since it has its own capacity to fix nitrogen, its requirement for fertilizer is relatively lower than other crops. Bush cultivar of french bean requires an amount of 40kg/ha of nitrogen, 90kg/ha of phosphorus and 90kg/ha of potassium as nutrient treatment. It is highly effective to apply half of N along with full P and K, as basal dose while making the furrows and ridges for sowing the seeds and also after a week from germination. Micronutrients are also very important for high productivity of french bean, hence 0.1% of B, Cu, Mo, Zn, Mn and Mg is recommended for improving the quality and pod formation. Apply 20 – 25 tons of FYM per ha for better nutrient management. Excessive application of nitrogen should be avoided as it may lead to vigorous vegetative growth at expense of pod formation. After sowing the seeds, weeds start to grow after 2 or 3 weeks. Initially, before sowing the field can be tilled and ploughed to remove all the weeds. After the seeds germination, the field requires weeding manually and hoeing at interval of 15 days twice to eliminate the potential threat by weeds. Weed can be controlled by application of 2 to 2.5 kg/ha Alachlor. Many weedicides like Stomp at 3L/ha or Goal at 750ml/ha can be sprayed for effective control of weeds for about 45 days. Another chemical Basagran can also be used to control broad leaved weeds. The larvae damage the leaves, buds, flowers and pods. The larvae damages the flowers and bore into fruit. Large entry holes are very evident which may lead to internal rotting. It can be controlled by spraying insecticides and also the insects can be removed by shaking the plant on white sheet. Mainly cowpea and pea aphids infest french bean. If aphid infestation is heavy, it causes leaves to turn yellow and necrotic spots appear on the leaves and shoots appear to be stunted. It also causes retardation in the growth of vines adversely affecting the yield. It can be managed by covering the plant with reflective mulches like silver coloured plastic and also by spraying the plant with strong water jet. One of the best way to control is use of insecticidal soaps or oil like neem or canola oil. It can also be controlled by spraying Methyl Demeton 25 EC or Dimethoate 30 EC each at 1ml/lit. It can also be controlled by spraying 1ml/L of water of Rogar or Metasystox. Spraying insecticides like Thiodan at 1ml/L or Sevin at 2ml/L is also highly effective. It feeds on the seeds of the damaged pods and also the larvae creates holes in the pod. The crop is infested from early budding stage and the eggs are laid on the flowers leading the larvae to enter the flowers. The caterpillars roll the leaves and web these with top shoots. It can be efficiently controlled by spraying Carbaryl 50 WP thrice at intervals at rate of 2g/L. The plant can also be dusted with Carbaryl 10D at rate of 2.5 kg/ha. It can also be controlled by spraying 2ml/L of water of Endosulphan or Thiodan or Malathion. Neem Seed Kernel Extract at 5% can also be applied if population exceeds. The adult weevils lay eggs on stored seeds and larvae bore into the seeds and feed on them till they mature. It leads to formation of holes which ultimately decreases the germination potential of the seeds. It can be curbed by fumigating the seeds with phosphine gas which is available in form of Celphos and Phosfume tablets, which can be applied at rate of 1 or 2 tablets per tonne of seed. The eggs are laid on the underside of the leaves which hatch in 8 days and they feed on the sap by sucking it. Early morning vacuuming of the plant so that the adults are unable to lay eggs is a control measure for small areas. It can also be controlled by placing yellow stick traps with castor oil which attracts the insects and they stick on the trap. It can also be controlled by spraying 0.25% Metasystox or Rogor in early crop stage. Forms small irregular brown coloured lesions on leaves which gradually turns gray brown with larger circles. The lesions collectively forms large necrotic patches. Plants which are grown in nitrogen and potassium deficient soils are more susceptible to this disease. It may lead to premature defoliation of leaves causing reddish brown lesions which merge into long streaks that develop on the pods. Small, dark brown to black lesions on cotyledons and lesions on stem occurs which appear to be sunken. Lesions also occur on the pods which are brown to purple in colour and appear to be sunken. When germination of infected seeds takes place, lesions develop of cotyledons and the spores can be spread by insects, humans or cultivars. It can be controlled by using pathogen free seeds. It can be effectively controlled by crop rotation . The disease can be controlled by spraying foliar sprays like Mancozeb at 2g/lit or Carbendazim at 1g/lit or Chlorothalonil at 2g/lit. Caused by a seedborne pathogen. It forms small, angular and water soaked spots on the lower leaf surface and forms a halo of yellow tissue which develops around each water soaked spot. On pods, the water soaked spots many become slightly sunken and reddish brown with age. In order to prevent occurrence of this disease, deep ploughing and pathogen free seeds are required. The seeds can be treated with streptomycin and can be curbed by spraying copper containing chemicals every 7 to 10 days on the infected plants. Leads to formation of water soaked spots on leaves which enlarge and become necrotic. The lesions coalesce and give the plant burned appearance. On pods circular, sunken and red brown lesion are formed on the pods. This disease can be caused by contaminated seed, wet weather conditions etc. This organism is commonly seedborne and as the germination occurs, bacteria contaminate the surface of the cotyledon and spread to leaves finally spreading across the vascular system. It can be controlled by crop rotation and deep ploughing can also eliminate infested bean debris in field. It can also be treated with copper based fungicide such as Kocide 101. Causes small oval, necrotic lesions on leaves. The leaf tissue around the lesion may appear puckered and they may coalesce and their centers fall out, giving leaves tattered appearance. Small lesions also appear on pods. It can be curbed by crop rotation and spraying of the plants with copper containing chemicals weekly. Is favoured by high humid conditions. It causes slightly raised, small white spots on the lower leaf and these spots turn red to dark brown. It can be managed and control by crop rotation and spraying sprays such as Baycor 30% EC, Anvil, Alto 100SL, Dithane M45 etc after every two weeks is highly effective. It can also be controlled by dusting sulphur at 25 kg/ha. Causes brown or red coloured spots with purple edges and grey to brown centres on the leaves, stalks and pods. This disease may cause the leaves to fall of pre maturely. It can be curbed by treating the seeds with chemicals like Fernasan D at 3gm per kg of seed. The disease can also be checked by spraying chemicals like Benomyl. French beans can be harvested in pod stage as well as can be harvested for its seeds. The pods are harvested in immature and tender stage, which are ready for harvest within 7 – 12 days after flowering. But harvest also depends totally on type of varieties. In bush varieties, 2 or 3 harvests are made and in case of pole type variety, 3 to 5 harvest are made. If the french bean are harvested for seeds, it is to be ensured that pods are harvested only after maturation. They should be harvested ideally before the seeds bulge out of the pod. The beans should be picked after morning dew is completely off and the pod is dry. Harvesting can be done manually or through machine but hand harvest is better. It should be carefully removed, so that the pods are not damaged. Harvested pods should be allowed to dry little under sun before packaging them. Make sure the pods are not squeezed. The yield greatly varies from types of cultivars, with 8 to 10 t/ha in bush varieties and 12 – 15t/ha in case of pole type french beans. It gives an yield of 1250 to 1500 kg/ha seeds. It is a major protein source and thus has greater demand across the world. The farmers enter into marketing strategy by encouraging contract farming, which involves price setting. They are grown by the farmers in large areas covering several hectares, which are brought to market for large scale selling via various middlemen and other traders. With a little more strategic marketing, it can be widely exported from India to various countries and also can be marketed on a large scale in India. The pods once harvested should be cleaned, graded and packed properly. It is very important that the pods are of good size and don’t bulge out. They should be picked up at the right stage. While harvested the pods, it is to be ensured that the pods are of equivalent size which after that are graded and selected through manual selection. After that the beans are packed for keeping it fresh for longer duration. Some growers pack it after harvest and some do it later. 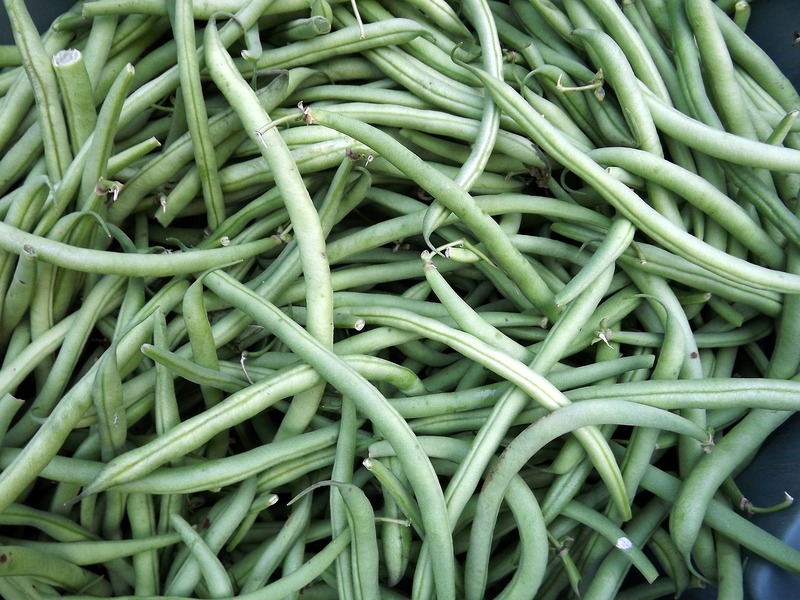 Generally, the french bean is packed in wooden or card board box. It is very important that the french beans are stored properly in order to increase their shelf life. In order to keep them from perishing, it should be immediately cooled at 4 to 5 °C. Dehydration and damage can be effectively controlled by instant cooling. In order to increase its self life, the pods after being harvested should be immediately cooled within 1 or 2 hours. It should be subjected to hydro cooling, by which large quantities of french bean are brought in contact with chilled water and is highly effective when the beans needs to be shipped. It is very important to use chlorinated water while washing and hydro cooling as it is a germicidal agent and can effectively control damage by decay causing organisms. The storage temperature should not be very low as it causes chilling injury. After the french beans are cooled, they are packaged in the container according to the marketing needs. After packaging it properly, it is shipped for marketing purpose. Where is availability of Seeds…? Mobile no/ Address please…?